Grit, Distortion, Range and “YEAH!” are all words you could use to describe James Hetfield’s unique and powerful singing voice. 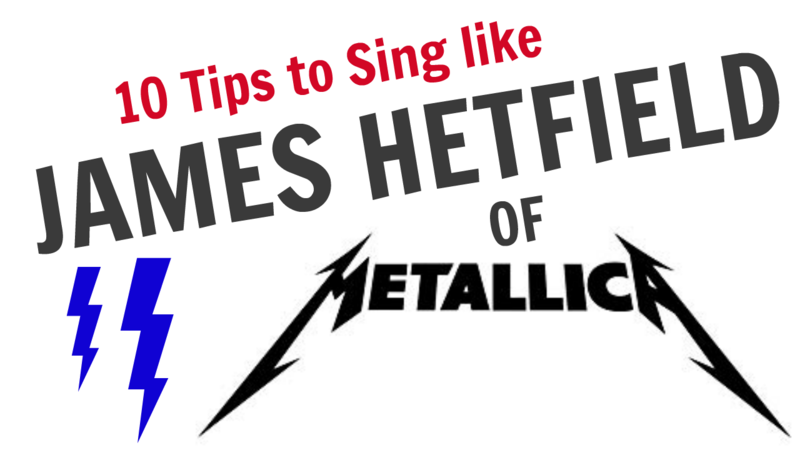 As the towering frontman of 80’s thrash metal legends Metallica, James was blessed with a powerful and extensive range that can be very tricky to approach for other singers – but with these 10 tips to sing like James Hetfield, songs like Master of Puppets or Sad But True no longer needs to be a struggle. Learning how to sing like James Hetfield takes time, practice and dedication to building a strong voice, so lets get started with 10 tips to sing like James Hetfield. The first thing you need to learn about singing like James is that singing with distortion and grit IS possible, and it CAN be achieved without strain or tension – so if you’re pushing and yelling to hit the high notes in Dyers Eve, then you’ve taken a wrong turn somewhere along the way in your vocal journey. Never fear, let’s fix it and get you yelling “YEAH!” and “OOOH!” and “I AM THE TABLE!” at the top of your lungs… without tension or strain. Breath Support often seems like a mystery to many singers, but it’s pretty easy in practice. Support in singing really refers to the balance of airflow vs air pressure, with an unsupported tone leaning towards airflow, and a supported tone leaning towards air pressure, which comes from sustained engagement of the diaphragm instead of letting your posture and breathing collapse as you ascend or hold a phrase. Learning to release tension so you’re not shouting and yelling when you hit those powerful highs is paramount to singing like James Hetfield. Have you seen the …And Justice For All tour footage from 1989? James is just standing there casually with that wicked, vicious voice spewing venom without the slightest hint of tension. Learning to sing without strain and tension is extremely important if you want to sing a full set of Metallica songs and keep your voice healthy and strong. Most likely without realising, James was a natural at creating vowel sounds in the right way. Speech pronunciation and properly articulated sung vowels are very different – with speech sounds often created using the articulators (the teeth, tongue, lips etc), and a vowel in singing created by the shape of your tongue and adjoining resonant space. There’s a reason why guys like James and Chris Cornell don’t struggle and strain to hit the highs, and it really has more to do with the way they sing their vowels than any natural gift of range. Just like many great ‘Tallica songs, singing itself is a balance between light and dark. The “darkness” in singing is the vowel located at the back of the head, that slightly classical sound you hear in many well trained singers. The “bright” is a forward placement which then gives you bite and power for those rapid fire and vicious lyrics. Grit and distortion like James uses with ease are actually very easy to achieve if you’re using the right approach. Distortion comes from excess compression and strong support – by slightly ‘holding’ in the glottis itself, you can create highly pressurised air that then rattles and grinds with the overtone of distortion that we know and love. An extension of your vowels, you can develop a higher range by allowing resonant space in the pharynx by raising the soft palate and altering the shape and length of the vocal tract itself. Do you even try to hit a high note and you ‘choke off’ or completely flip to falsetto? That’s due to a lack of resonant space. Learn to sing your vowels properly and create resonant space for a killer range that is as endless as it is powerful. You’ll hear resonant space in James’ voice when he sings higher notes in songs like Master of Puppets – “Crumbling Away” becomes a very open AH vowel on crumbling, and an open AY vowel on away. By learning to create and manage your resonant space, you will be able to sing with an extensive range. Developing a balanced onset will allow you to sing effortlessly and consistently, even for very long sets and shows. Every single element of the voice can be linked to balance in one form or another, and every issue you experience can be traced back to a lack of balance. A fantastic singer isn’t necessarily a ‘strong’ singer, they’re actually a ‘balanced’ singer. James was never one to mince words… or slur them either. You can clearly hear every single word that James sings, no matter what range or style he was using at the time. This comes from consonant grouping, which to some comes more naturally than others. A great example of this is the quintessential Hetfield “YEAH!” – if you try this yourself, no doubt the “Y” consonant is very difficult and probably uncomfortable in your throat. Now, if you try it again but replace the “Y” with a pure “EE” vowel, like “EE-EAH!”, you’ll notice how flawless and easy it can be to sing consonant sounds when you make slight adjustements such as the one I’ve just shared with you. Try it yourself; W can be replaced by OO, R and L can partially be built from an OO as well, a Y is an EE and your plosive sounds like P and B are actually interchangeable. James might not have been the world’s most classically trained singer, but he was always perfect when it came to pitch! Pitch comes from the frequencies that you create, not from what you hear. This is why practicing scales all day long will never improve your pitch, but specific tonal and frequency exercises will perfect your pitch almost instantly. All in all, James was a great singer, and naturally so. One of the most important aspects of James’ voice that make Metallica such a classic and timeless band is the stylistic choice he employed throughout the various era’s of Metallica’s history – from the high range and bright timbre of Ride the Lightning and Master of Puppets, the gruff and percussive power of … And Justice for All, the powerful melodies and harmonies of the Black Album, bluesy tone and vocal lines of the 90’s on Load and Reload, yelling over a trash-can snare for St Anger, right back to a more classic Hetfield style on their later ‘return to roots’ records, albeit with less grit and distortion. Developing your own personal style as a singer really will make you stand out from the pack! Learning how to sing like James Hetfield takes time and practice, but it’s absolutely possible with the right approach and a pragmatic approach to singing techniques like vowels, support, articulation and resonance – all of which James was a master of (puppets). A great place to start with learning how to sing like Papa ‘Het is this exclusive singing lesson, designed specifically for singers like you who want real answers to your questions, and practical techniques and tips that will help you sing the songs you want to sing, in the WAY you want to sing them. Foundation 101 will put the keys to your voice and the keys to your own singing progress and continued success in your own hands, and allow you to make continued progress and gains, and best of all you can work through the course at your own pace and take your time to perfect the voice of your dreams. If you want to sing like James Hetfield, Foundation 101 is a great place to start! If you have any questions about learning to sing like James Hetfield, feel free to leave any feedback or questions below! I would want to book a Skype lesson with u.. what’s the price though? Really enjoyed reading your post. I will certainly have to try some of these methods out regarding the posture. I also liked how you connected the breathing with the posture and emphasized the importance of building mix voice. Keep it up! Thanks Paul! Let me know how it goes – you can find my full foundations warmup in my free course Breathing 101. When you’re ready to take it to the next level you’re welcome to book a Skype session with me and I’ll show you how to sing like James Hetfield the right way! Thanks for the tips brother, Great Value!! How much are your Lessons and do you teach complete novices like myself ? Hey Marvin! Thanks for the kind words – you can see my pricing in the online booking calendar, but in short a session starts around $40. Absolutely, I teach both professionals and beginners alike! Wow, you’ve got nice content here, mate. Really great videos and easy to follow. Metallica is one of my favorite bands and I (too) am amazed at how high he can sing and having so much power. I’ve never had any private lessons before, but learned a few tricks by watching you singing lessons on YouTube. Your channel seems pretty interesting. I’m going to subscribe. Good job Kegan! Great to hear, Ben! Thanks for the kind words. Absolutely, it’s all in your technique and approach – let me know if you have any questions about your voice! To get that ‘Hetfield’ sound, developing your mix register is an absolute must.